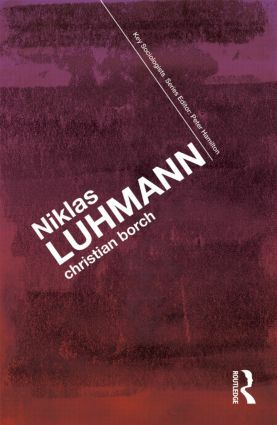 Niklas Luhmann offers an accessible introduction to one of the most important sociologists of our time. It presents the key concepts within Luhmann’s multifaceted theory of modern society, and compares them with the work of other key social theorists such as Jürgen Habermas, Michel Foucault, and Zygmunt Bauman. The book pays particular attention to introducing and discussing Luhmann’s original sociological systems theory. It presents a thorough investigation into the different phases of his oeuvre, through which both the shifting emphases as well as the continuities in his thinking are shown. The primary focus of this text is Luhmann’s theory of modern society as being differentiated into a plethora of ‘function systems’ – such as politics, law, and economy – which operate according to their own distinct logics and which cannot interfere with one another. For Luhmann, this functional differentiation works as a bulwark against totalitarian rule, and as such is a key foundation of modern democracy. Furthermore, the book critically examines the implications of this functional differentiation for inclusion and exclusion dynamics, as well as for the understanding of power and politics. This is a key text for both undergraduate and postgraduate students of areas including contemporary social theory, political sociology, and sociology.